Caspian Black exterior and Black interior. Sunroof, NAV, Heated/Cooled Leather Seats, Satellite Radio, iPod/MP3 Input, Premium Sound System, Alloy Wheels, Panoramic Roof, Back-Up Camera. CLICK ME! Leather Seats, Navigation, Sunroof, Panoramic Roof, Heated Driver Seat, Cooled Driver Seat, Back-Up Camera, Premium Sound System, Satellite Radio, iPod/MP3 Input, Onboard Communications System, Aluminum Wheels, Keyless Start, Dual Zone A/C, Lane Keeping Assist MP3 Player, Remote Trunk Release, Keyless Entry, Steering Wheel Controls, Child Safety Locks. 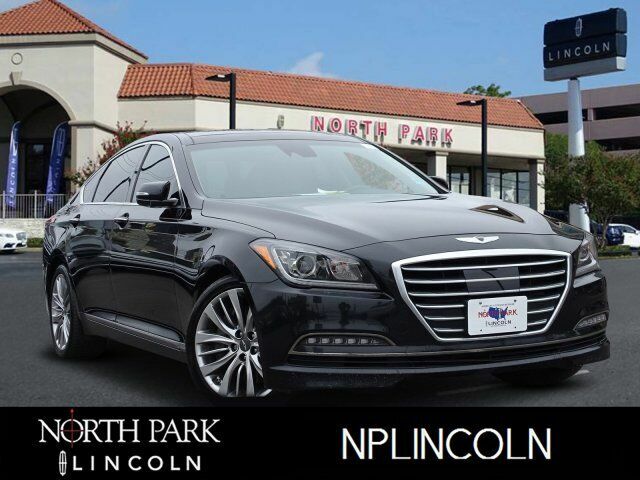 2015 Hyundai Genesis with Caspian Black exterior and Black interior features a 8 Cylinder Engine with 420 HP at 6000 RPM*. Every panel and piece inside the Genesis fits with intense precision that matches just about any premium sedan you`d care to compare from Germany or Japan. -Edmunds.com.